The final four teams are set and this Sunday will determine the two teams heading to Atlanta for Super Bowl LIII. Here's a preview of the AFC Conference Championship Game between the Patriots and the Chiefs. Conference Championship Sunday begins with the NFC title game between the Los Angeles Rams and the New Orleans Saints followed by the AFC Championship Game featuring the New England Patriots and the Kansas City Chiefs. The top two seeds in each conference advanced to the Conference Championship games for the first time since 2015 and for just the eighth time in the 29 seasons since the 12-team playoff format was instituted in 1990. During the 2018 regular season, the Chiefs led the NFL with a scoring average of 35.3 points per game, followed by the Rams (32.9), Saints (31.5) and Patriots (27.3). This Sunday marks the first time in the Super Bowl era in which the four highest scoring teams in the regular season all advanced to the Conference Championships. However, in the Divisional round, defense loomed large as both the Patriots and Chiefs came up with big defensive plays on their way to victory. Kansas City Chiefs linebacker Justin Houston recorded two sacks and a forced fumble in the Chiefs win over Indianapolis last weekend while New England held the Chargers to 19 rushing yards in their Divisional round victory. The AFC Conference Championship game features a rematch of memorable 2018 regular season game. The Patriots hosted the Chiefs on October 14 in a Sunday Night Football game and came out with a 43-40 victory. Like the NFC Championship game, the AFC Chmapionship features a quarterback matchup between an all-time great (Tom Brady) and an outstanding young star (Patrick Mahomes). Patriots quarterback TOM BRADY, the NFL's all-time playoff leader in wins (28), passing yards (10,569) and touchdown passes (72), heads to Arrowhead Stadium in Kansas City to take on Chiefs second-year quarterback Patrick Mahomes, who became the third quarterback to record at least 50 touchdown passes in a single season. In their Week 6 meeting, a 43-40 win by New England, Brady passed for 340 yards and had two touchdowns (one passing, one rushing) while Mahomes recorded 352 passing yards and four touchdown passes. The Patriots and Chiefs meet in the postseason for the second time. New England won the previous playoff meeting, 27-20, in the 2015 Divisional Round (January 16, 2016). The Chiefs lead the all-time series (including postseason), 18-15-3. The teams last played in Week 6 (October 14), a 43-40 Patriots victory. New England has advanced to its eighth consecutive AFC Championship Game and are the first team since the 1970 merger to play in eight consecutive Conference Championship Games. The Patriots are also now the only team in NFL history to advance in the playoffs for eight straight seasons (2011-18). The New England Patriots are 10-4 in the AFC Championship Game. A Patriots win onA win over Kansas City in the AFC Championship Game would result in the Patriots' third straight Super Bowl appearance and extend their NFL record to 11 Super Bowl appearances. The Patriots can join Miami (3) and Buffalo (4) as the only teams to reach three consecutive Super Bowls or more. New England won its 10th consecutive division title, the longest streak in NFL history. The Patriots are the only team to win 15 division titles in a 16-year span. The Patriots defeated the Los Angeles Chargers 41-28 last week in the Divisional Playoffs. Patriots head coach BILL BELICHICK and quarterback TOM BRADY have won 28 postseason games together, the most in NFL history by a head coach and starting quarterback combination. Belichick has advanced to 13 Conference Championship Games, the most by a head coach since the 1970 merger. Brady has 28 career playoff wins, the most by any starting quarterback in NFL history. Brady is also the NFL's all-time postseason leader in career completions (954), attempts (1,508), passing yards (10,569) and touchdown passes (72). Last week against the Chargers, Brady passed for 343 yards and one touchdown for a 106.5 passer rating. He has 15 playoff games with at least 300 passing yards, the most in NFL history. Patriots rookie running back SONY MICHEL rushed for 129 yards and three touchdowns in his postseason debut, while running back JAMES WHITE caught 15 passes in the Divisional Round, tying an NFL postseason record (running back DARREN SPROLES, New Orleans at San Francisco, 1/14/12). The Patriots had two players selected to the 2019 Pro Bowl: quarterback TOM BRADY and cornerback STEPHON GILMORE. 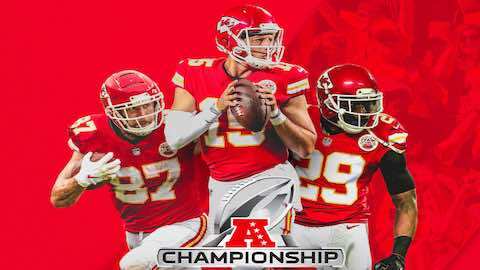 Kansas City will play in the team's fifth AFL/AFC Championship Game and Sunday's game marks the Chiefs first AFC Championship Game appearance since 1993 (January 23, 1994 at Buffalo). The Chiefs are 3-1 in the club's previous four appearances. Chiefs quarterback PATRICK MAHOMES led the NFL with 50 touchdown passes this season, joining TOM BRADY (50 in 2007) and PEYTON MANNING (55 in 2013) as the only quarterbacks with at least 50 touchdown passes in a single season in NFL history. Kansas City tight end TRAVIS KELCE caught seven passes for 108 yards in the Divisional Round. In the regular season, Kelce had 1,336 receiving yards, the second-most in a single season all-time by a tight end. Defensive lineman CHRIS JONES ranked third in the NFL this season with 15.5 sacks and had at least one sack in 11 consecutive games (Weeks 5-16), the longest streak in a single season since the individual sack became an official statistic in 1982. The Chiefs had six players selected to the 2019 Pro Bowl: tackle ERIC FISHER, outside linebacker DEE FORD, wide receiver TYREEK HILL, tight end TRAVIS KELCE, quarterback PATRICK MAHOMES and fullback ANTHONY SHERMAN. Last week, I correctly predicted the Chiefs, but was totally wrong as the Patriots defeated the Chargers 41 - 28. I still think the Chargers are better than the Patriots. This week, I'm picking the Chiefs with a much higher level of confidence because the game is in Kansas City and the Chiefs are the better team. Give credit to the Patriots for their dominating performance at home against the Chargers last week. But this week their on the road. During the regular season the Patriots were 3-5 on the road. Their last 3 road appearances in an AFC Championship Game has resulted in a loss most recently to the Denver Broncos in 2015. I'm not the first to get burned picking against Brady and Belichick and I won't be the last. But it's not going to happen this week no matter what the weather brings this Sunday. The New England Patriots improved to 4-2 after K Stephen Gostkowski kicked a 28-yard game-winning field goal at the buzzer to lift the Patriots to a 43-40 victory over the visiting Kansas City Chiefs on Sunday Night Football. Kansas City entered the game with a perfect 5-0 mark. Kansas City QB Patrick Mahomes connected with WR Tyreek Hill on a 75-yard touchdown pass to tie the game at 40 with 3:03 remaining. The touchdown helped Kansas City erase a 15-point halftime deficit after New England took a 24-9 first-half lead. The victory was Brady's 227th career win, moving him at the time, past K Adam Vinatieri for the most career wins ever by an NFL player. It was also his 200th career regular-season win. He is one of four players with 200 wins, and the only quarterback with 200 regular-season wins. The Patriots offense produced 500 total yards and did not punt or commit a penalty, marking the first such occurrence in the Super Bowl era. Brady finished with 340 yards passing, rookie RB Sony Michel had 106 yards rushing and TE Rob Gronkowski caught three passes for 97 yards, including a key 39-yard reception during the game-winning drive. He also added a 42-yard reception on a field-goal drive in the fourth quarter. During the game-winning drive, Michel converted a third-and-1 and two plays later, Brady and Gronkowski connected on a 39-yard play to get to the Kansas City 9-yard line. After Brady took a knee, Gostkowski drilled a 28-yard game-winning field goal as time expired to give New England the win. In the first half, the Chiefs settled for field goals and threw two interceptions. LB Dont'a Hightower intercepted Mahomes and returned the ball 27 yards to the Kansas City 4-yard line to help set up a 4-yard touchdown run by Michel that gave New England a 10-3 first-quarter lead. After a Brady to WR Julian Edelman touchdown pass and a 1-yard touchdown run by Michel, the Patriots extended their first-half lead to 24-9. DB Duron Harmon intercepted Mahomes in the end zone with 17 seconds left in the first half to preserve the lead heading into the locker room. In the second half, it was Kansas City scoring touchdowns and the Patriots settling for field goals. First, Mahomes threw a 67-yard touchdown pass to RB Kareem Hunt, and after trading field goals, the Chiefs took advantage of a short field following a Brady fumble with a 14-yard touchdown pass to Hill. That touchdown cut the Patriots lead to 27-26 heading into the final quarter. After New England extended its lead to 30-26, a 97-yard kickoff return by CB Tremon Smith followed by a 1-yard touchdown pass to Hill put Kansas City in the lead, 33-30. That advantage was short-lived, as the Patriots responded with a 75-yard drive that ended with a 4-yard touchdown run by Brady for a 37-33 lead. A 42-yard pass to Gronkowski helped set up a 50-yard Gostkowski field goal for a 40-33 lead, but on Kansas City's first play from scrimmage, Mahomes hit Hill for a 75-yard touchdown to tie the game at 40 and set up the Patriots game-winning drive. NFL Football: "AFC Conference Championship Patriots vs Chiefs Preview - 2019"